This is the most delicious comfort food for cold mornings that I know. It is definitely on my list of favourites and although excellent for a cold, frosty morning, I also make this dish frequently in the summer whilst staying over on the Isle of Wight. It keeps in the fridge for a few days and a bowlful reheats beautifully in the microwave. Supposed to be a breakfast dish, but I can be found having a bowl of this oatmeal at any time of the day when I am feeling peckish. Preheat the oven to 375°F (180°C). Grease the base of a 8 x 10 inch (20 x 25 cm) baking dish with coconut oil and then set aside. I use a large oval dish. 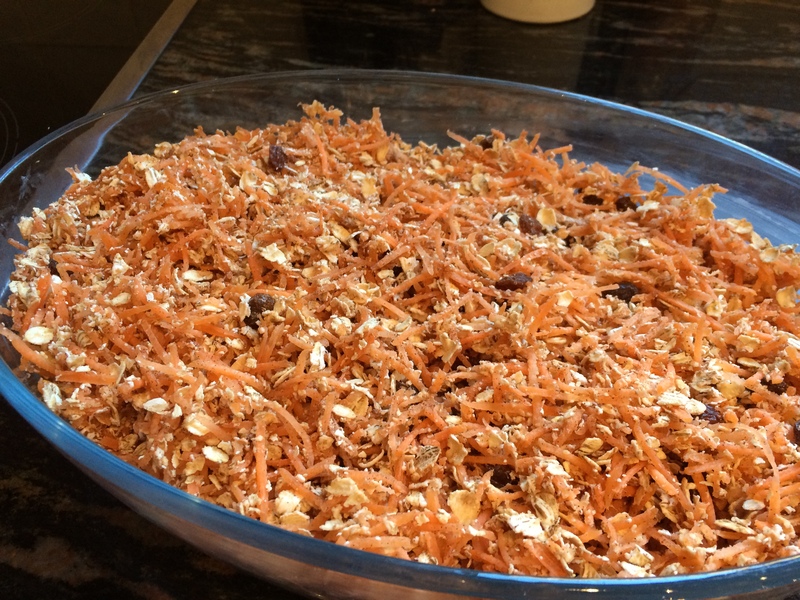 Combine the oats, baking powder, spices and salt in a mixing bowl, then add grated carrots and raisins and stir to mix. 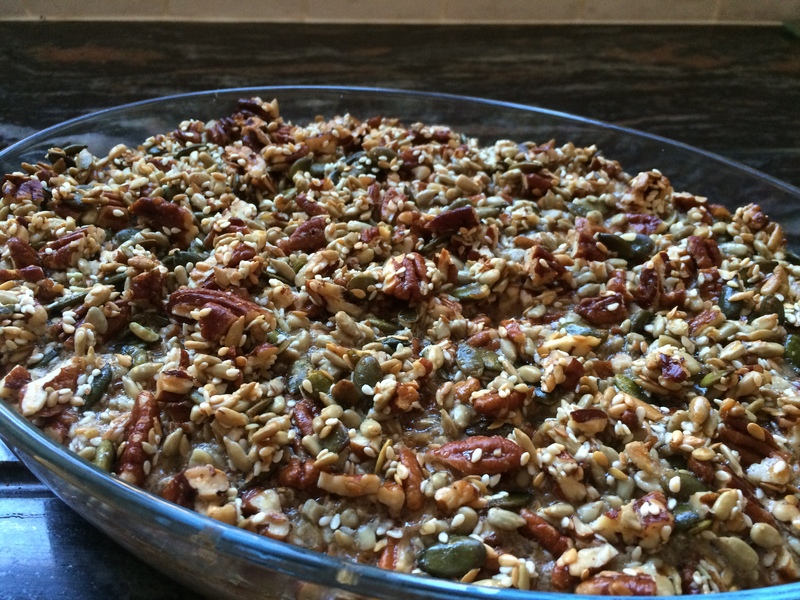 Spoon the oat mixture into the baking dish. To create the crunchy top layer, put the syrup, coconut oil, walnuts and sunflower seeds in a small bowl and mix with your fingers to make sure everything is well coated. I buy packs of a seed trail mix in bulk every time I visit Aldi – these tubs are a perfect mix of seeds for this dish. They are also ideal for sprinkling on top of porridge or adding to a bircher. In a separate bowl, beat the eggs, add the milk and vanilla extract and whisk well to combine, then pour the egg mixture over the oats so everything is evenly soaked. Sprinkle the seed and nut mixture on top and bake for 25 – 35 minutes. 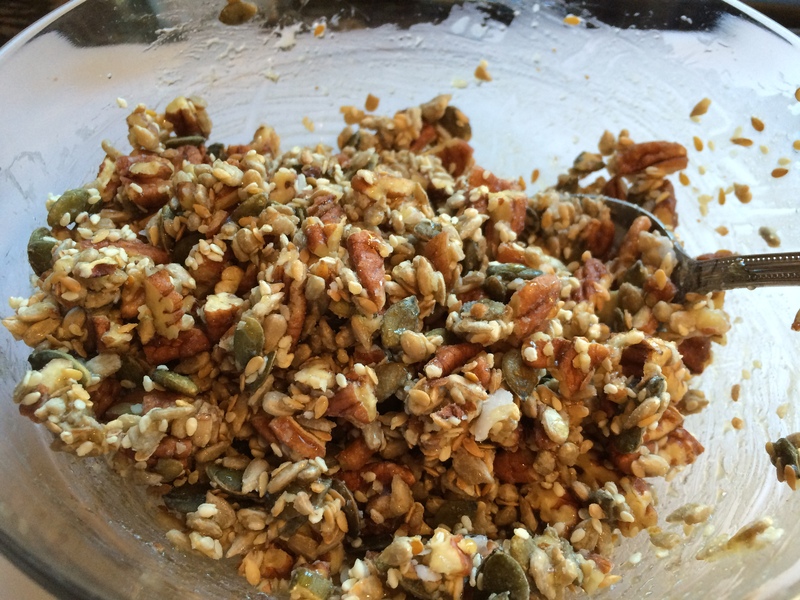 When it’s done, the oatmeal should be set and the nuts and seeds lightly browned and crunchy. Leave to cool slightly before serving. 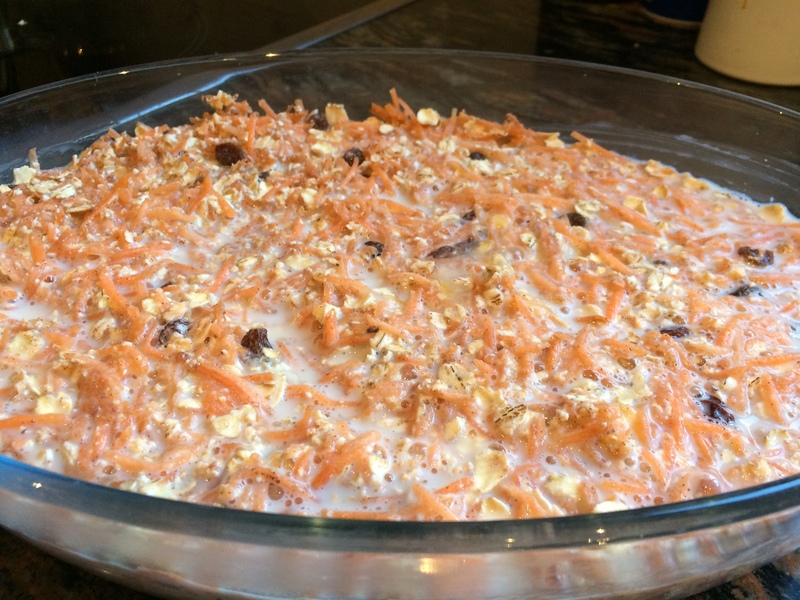 This entry was posted in Breakfast, Miscellany, Vegetarian and tagged Almond Milk, Breakfast, Carrot Cake, Carrots, Gluten Free, Healthy Eating, Oats, Vegetarian, Wheat-Free. Bookmark the permalink.